Antar chose DataFile as a direct replacement for Sage Line 100, for which we were an accredited Sage Solutions Centre, following their decision to withdraw the product. This came as a result of extensive research into products that would provide at least the same level of functionality and flexibility that was afforded by Sage Line 100. DataFile both met and exceeded these requirements. We have subsequently migrated a number of our existing clients across to DataFile and during this process we have developed a suite of programs to make this transition as smooth as possible. The sales ledger shows a full view of Customer information from individual credit terms, limits and balances to full trading and payment histories. A user defined account code structure ensures consistency of data entry and a full hierarchy of Statement / Invoice and Delivery addresses can be maintained with unlimited numbers of Contacts attached to each. All transactions can be retained even after Period and Year ends whilst enquiry filters can be set to only display the information required. The Credit Control manager provides disciplined debtor chasing actions to help expedite cash collection and keeps full debt chasing communication history. The purchase ledger allows automation and management of Supplier payments and gives a full view of all account information from individual credit terms, limits and balances to full trading and payment histories. As well as Nominal Ledger allocation, additional analysis detail can be captured as part of invoice processing and special error correction routines ensure clarity when reporting on transaction history. All transactions can be retained even after Period and Year ends whilst enquiry filters can be set to only display the information required. The nominal ledger produces management reports at the touch of a button, and allows you to implement budgeting systems with the minimum of effort. You can use the nominal ledger at a management level to record income and expenditure for monthly reporting and include accruals, prepayments, depreciation which then allow the production of full monthly profit and loss accounts, balance sheets and other any other financial statements required. Journal posting can be strictly controlled either through security or pre-populated templates and full audit trails show transaction posting either chronologically or by account. Comprehensive cash management is provided by the cash book module. Any postings made in the cashbook update Sales, Purchase, and Nominal Ledger in real time. An unlimited number of bank accounts can be set and transfers between accounts easily managed. The Bank Reconciliation resolves conflicts between the system and bank statements ensuring the bank account is always up to date whilst the Cashflow Forecaster draws together unpaid transactions from the Sales and Purchase ledgers to give a future bank position. Project and Job Costing integrates with Purchase Order Processing, Sales Order Processing, Stock Control, Purchase Ledger, Sales Ledger and Cashbook. Using a flexible cost code structure the Actual values are posted from the supporting ledgers and compared against budgets for costs and time. Profitability can then be analysed either at a Project or Job level. Budgets can be set both on a cost and hours basis and held at Project level or individual Job. They can be entered in total or as part of an auditable transaction process. The system shows Budget/Actual Variances at all levels and Email Alerts can be set to inform when Actuals exceed Budget. When posting Purchase Invoice costs through to Project Costing the system can validate against exceeding budget and a password can be set to prevent / allow processing. Standard templates of Activities can be linked to Projects. These can be used to detail key tasks within a particular job. Multiple definable Status options can also per tracked to define and track project milestones. Time can be booked to projects in Hours / Minutes or decimal values. They can either be imported into the system using the Integrations facilities or entered directly onto the system. An optional Authorisation process is available to ensure accuracy of data entry. Project Costing includes standard key reports such as Project Statements, Timesheet Analysis, Work in Progress Listings and these can all be customised if required. All reports can be transferred to Microsoft Excel, Word, and PDF and sent via email. Tight security can be put in place to restrict user’s access to any option with Project Costing ensuring users only see the options they need. Any file or scan can be linked to a Project or Job. Documents generated through the system using the mail merge facility are recorded allowing visibility of all correspondence. Emails sent to Project Managers through Datafile are also logged and critical incoming Email can be recorded against a Project or Job using the Microsoft Outlook Add In. The Datafile payroll system can either be used as a stand-alone or as an integral part of your Datafile Software installation with links to the nominal ledger and job costing. However you plan to use your payroll system you gain the benefits of easily maintained employee details, speedy input of details for each pay period & very flexible reporting. Payrolls can be processed Weekly, Two-Weekly, Four-Weekly or Monthly periods. All information including document scans, memos, appraisal and disciplinary notes, salary review details, contracts of employment etc can be stored against the Employee for easy review. An employee calendar allows the recording of Absence along with reason codes and notes. Automated processing and reporting on statutory payments (SSP/SMP/SAP/SPP), Student Loan Deductions, and Attachment of Earnings orders. Up to 20 Overtime rates can be recorded for each employee up to 80 further payment and deduction types can be defined with their own Tax / NI profile. Payroll records are retained indefinitely for each tax year together with supporting employee payslip and P60 documentation which can be re-printed as required. The Payroll comes with the usual key reports – Department Summaries / Payslips / Payment Analysis / Deduction Analysis and these can all be customised if required. All reports can be transferred to Microsoft Excel, Word, and PDF and sent via email. Tight security can be put in place to restrict user access to any option within the Payroll ensuring users only see the options they need. E.g. Weekly versus Monthly payroll operators / employees versus directors. Full support for the Government Gateway End of Year P14 and P35 returns together with in year movements of form P45 / P46. A software maintenance plan ensures compliance to all current statutory legislation and any amendments to tax or national insurance thresholds. Data from each payroll period is automatically stored and can be re-instated in the event of omissions or error. A wide range of functionality exists within these modules to ensure order entry is fast and efficient whilst at the same time presenting the information you need to make important selling or buying decisions. The system can be adapted to suit a wide range of business needs ranging from Manufacturing and Distribution type businesses to Contracts and Serviced based organisations. Workflow can be set using the extensive range of simple parameters available in both order entry and document production to ensure rules are followed to your specific business processes. Simple customisation tools allow data entry forms to be designed to follow the information flow of your business and a wide range of additional data item types can be created to record supplementary information relating to orders and product lines. Tight integration with the financial ledgers is standard and our suite of integration tools allow integration with third party systems such as websites. The Sales Order Processing module enables you to maximize your sales potential and increase profit by providing a slick and fast order entry system. Quotes and Enquiries can be logged for prospects and clients and tracked through definable stages to give pipeline and sales forecast information. Sales order information can be configured to only capture the information you require in order you need to process it and a full customer history including pricing can be displayed on order entry to review previous trading activity. Credit control is a key element of order processing so rules can be set by user as to when a client is placed on stop or actions required when a credit limit is exceeded. A compressive set of pricing options exists including customer specific pricing, promotions, minimum selling price rules and discounts. Where packs are sold items can be sold individually and surcharges applied where split pack items are processed. All standard documents such as Quotes, Order Confirmations, Picking Notes, Delivery and Returns, Invoices and Credit notes are customizable and can be emailed directly to clients. Document processes can be linked meaning that when say a delivery note is generated then an invoice is automatically produced. Each document can contain its own rule set to ensure validation of processing. E.g. A credit note cannot be raised for more than delivered / invoiced etc. Returns Management is standard and reasons for return captured and then used for analysis. A wide range of customizable standard reports are available and Smartlists can quickly present relevant filtered information either on screen or sent to MS Excel where hard copy reports are not required. The Purchase Order Processing module provides all the functionality needed to control costs along with a slick and fast order entry system. Requisitions, Order Authorisation stages, and limits on what individual users or departments can spend can be built in to ensure tight control. Purchase order information can be configured to only capture the information you require in order you need to process it and a full supplier history including cost pricing can be displayed on order entry to review previous trading activity. A compressive set of pricing options exists including a Supplier Matrix to record agreed contract pricing and expiry dates. This matrix can automatically import pricing data (where available) from a supplier system to ensure accuracy of data entry. Where purchase orders are directly linked to sales orders then full Back to Back options are available to generate orders automatically either in either consolidated or individual line form. All standard documents such as Requisitions, Order Confirmations, Goods Received and Return to Vendor notes are customizable and can be emailed directly to suppliers. Document processes can be linked meaning that when a Purchase Invoice say is processed with a query or dispute then a document with the query or dispute details is automatically generated to send to the Supplier. Each document can contain its own rule set to ensure validation of processing. E.g. A return to vendor note cannot be raised for more than received etc or an Order Conformation cannot be processed if an order has not been authorized. Returns to Vendor Management is standard and reasons for return captured and then used for analysis to review supplier performance. The Stock Control module ensures that stock items are managed and tracked effectively. Stock levels can be optimised using the information held in the system and it can advise what to order and when to order it. By using lead times re-ordering can be planned more effectively and reduce the burden on cashflow. An accurate and up to date stock-holding will ensure delivery promise dates to customers are correct. A full range of costing and valuation methods can be used – Average, FIFO, Standard, Weighted Average and the system can cleverly avoid exceptions such as FOC samples when calculating these. Up to 9 standard selling price lists as well as the Customer Discount Matrix where unique pricing can be applied to specific Customer Group / Customer / Product Group / Product combinations. The system will freeze stock quantities ready for stock count quantities to be entered in or brought in from other data capture devices. Discrepancies can either be written off automatically or individually then analysed as to the reason for the variance. Stock items can be analysed on an individual basis using Batch or Serial numbers. Numbers can be automatically allocated or manually entered against a pre-defined coding structure. These items can also carry details such as Bin Number, Lot Number, Best Before and Sell By Dates. Batch and Serial numbers are carried right through the system from Purchase / Production right through to Customer despatch ensuring the ability to assess and trace any warranty claims and product faults quickly. A Batch or Serial items code can have a maximum of 32 characters and controls applied to how the code is formatted ensuring consistency of entry. A status can be assigned to individual batches or serials along with an appropriate reason code. Matrix templates can be created using up to 3 variants e.g. Colour / Size / Width and then batch codes automatically generated. Matrix reports can then be produced showing the quantities available in all of the different combinations. This provides you with increased control over your stock. You can specify whether or not a batch has passed inspection, the date on which inspection was performed, and a code to identify the inspector. You can also enter a memo to record quality. Using Stock Assemblies, Works Order Processing captures and processes stock component parts from initial works order right through to assembly and production. Works orders can be placed individually or managed through automatic transfer from Sales Order Processing. The system calculates stock requirements and warns of any shortfall allowing substitutions if necessary. Stock is then reserved on both finished items and component parts accordingly. Works Orders can be generated to enable the kitting and assembly of components through single instructions or as part of a multi-levelled set based on a Bill of Materials. Raw materials or complex products can be disassembled to generate other products. E.g. a sheet of ply maybe cut to make a quantity of a smaller product or a combination of products based on a number of different Bills of Material. This process can be used in combination with Assembly Works Orders and Shortfall Processing. Works Orders can contain Routing or Notes to assist with planning through the assembly life-cycle. Stock can be reserved on a Works Order at both component and finished goods level. Documents can then be raised to instruct production. This is the final reconciliation of parts and labour consumed in the assembly of the finished product. The quantity of finished items, the quantity of hours and parts used can all be amended. The system will record both the standard works order quantities required and the quantities consumed. This allows powerful variance reporting which will assist in minimising Wasteage and improving yield. Transactions from any third party system can be brought into the Datafile ledgers. This is done in a controlled and auditable environment ensuring system integrity at all times. Data can be imported in an CSV / XML or any other structured file format and then validated against the records held in Datafile Software. Once imported the system displays a control reporting showing accumulated values to enable reference back to the originating system. Multiple templates can be created to allow mapping of data items between the source system and Datafile. Transactions carrying multiple analysis lines such as Nominal codes can be processed. Default references and descriptions can be set and selection criteria applied at run-time. Master Account records can also be created as part of the same Integration run ensuring there are no transactions left orphaned. The control report generated following processing can be customised to incorporate any data item being brought in from the third party system. Multiple templates can be created to allow mapping of data items between the source system and Datafile. Parameters can be set as to how to manage negative values and the routine can either use the originating transaction date or the processing date for transfer to Datafile. The control report generated following processing can be customised to incorporate any data item being brought in from the third party system. 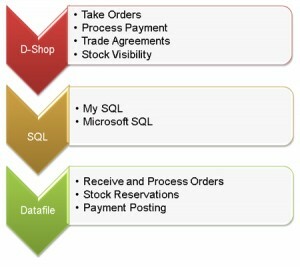 Sales and Purchase orders can be generated from any Datafile table as well as third party file outputs. As with the other Integrations above, any data item from a third party system can be processed and held in the Datafile system. Master account records such as Customer and Suppliers can be included in a single update run to streamline the process. A common application of this is to bring in orders from websites where the system can validate special customer pricing from the Datafile Discount Matrix. DShop E-Commerce is packed with features to help you make the most of your e-commerce website. Within all aspects of DShop E-Commerce, you’ll find the system highly configurable so you can tailor it to your particular requirements. This provides you with a depth of feature that competitor products find hard to match. With the administration system laid out cleanly and logically, you should never find yourself lost. The day to day running of your store is also quick and easy for non-technical people. Remove data maintenance overheads, maintain your business data once inside Datafile Software and let DShop E-Commerce present it for you online. Product, pricing, customer account, delivery and payment details are all based on Datafile Software settings and parameters. Never miss an order, DShop E-Commerce synchronises with Datafile Software when the back-office system is available and online but can run independently in case of communications failure or planned back-office downtime.